Published on February 6, 2010 in Bands/Artists, Eastern Iowa, Music, Out and About, Upcoming Show and Vinyl. 0 Comments Tags: "bettina richards", "thrill jockey", Blue Moose Tap House, David Daniell, Doug McCombs, Iowa City, Live, Sycamore, Tom Verlaine, Upcoming Show, Vinyl, Warm and Cool. 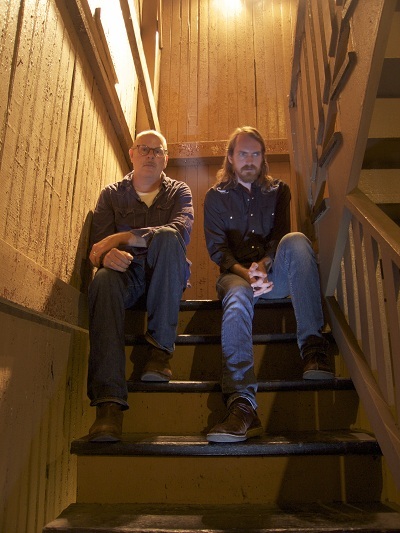 Birthed from the very fertile improvisation and post rock scene in Chicago comes the collaboration of guitarists David Daniell and Douglas McCombs. David Daniell’s career dates back to 1996 with work in the improvisation group San Agustin. Between his collaborations and solo work he has established a pretty substantial recorded career. 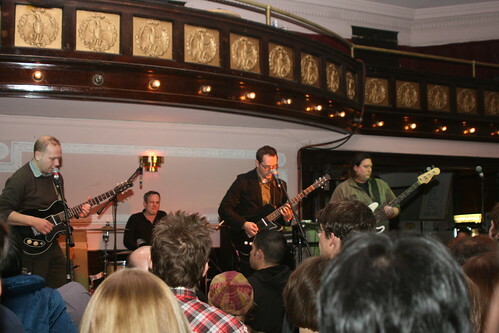 Daniell met Doug McCombs when they toured together in 2006 in Rhys Chatham’s six-guitar Die Donnergötter band. 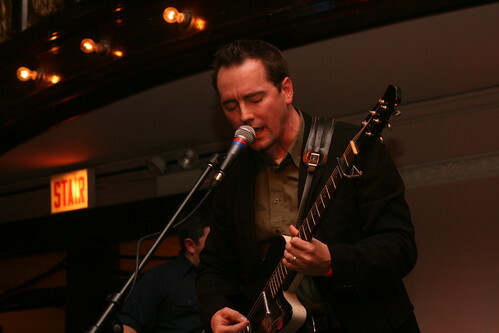 McCombs notably plays bass and guitar in Tortoise as well as his solo project Brokeback and Eleventh Dream Day. This meeting cemented a relationship of the two music fans where they exchanged records which lead to the recording sessions that would result in their 2009 release Sycamore on Thrill Jockey. Sycamore was recorded over five days in two Chicago loft spaces chosen for their acoustics. The resulting seven-and-a-half hours of music was pared down to the four songs on the album by Daniell and McCombs in editing sessions in a fashion recalling how the late Teo Macero worked with Miles Davis on albums like In A Silent Way (a personal favorite). Final editing and mixing was done by Tortoise compatriot John McEntire at the legendary Soma Studios. The resulting album is an impressive execution. The ambiance of the record reminds me a lot of Tom Verlaine’s 1992 album Warm and Cool which was very a very influential record for me when it came out and was re-released by Thrill Jockey in 2005. Clean, layered guitars, sparse percussion provide what is a great soundtrack for my day. Coincidentally, Bettina Richards– the label head for Thrill Jockey— told me when I visited last year that it was Doug who turned her on to the Verlaine album. David Daniell and Douglas McCombs will be playing The Blue Room at the Blue Moose Tap House (which used to be The Industry, and before that The Cue) on Thursday, March 4th. The opening act will be Star City and another act to be announced. Doors are at 8 PM and tickets will be $7 and are general admission. You can purchase tickets in advance at TicketWeb. 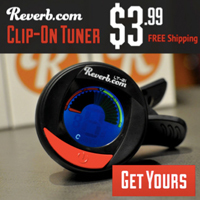 Published on January 17, 2008 in Bands/Artists, Music, Out and About, Reviews and Vinyl. 0 Comments Tags: "archer prewitt", "bettina richards", "bobby conn", "fiery furnaces", "fred anderson", "lonesome organist", "school of language", "Thalia Zedek", "the sea and cake", "thrill jockey", arbouretum, brokeback. In 1992, Bettina Richards– frustrated at the inequity of the handling of artists– left her A&R job at a major label to start her own label with some very clear ideas about how to do it. 15 years later, that label– Thrill Jockey– has become a benchmark against other small independent labels are measured for contracts, quality of recording, packaging and recently digital distribution. It’s certainly a testament to Bettina’s leadership and vision that Thrill Jockey has been around for 15 years. It isn’t unheard of in the industry– its contemporaries like Touch and Go/Quarterstick, Matador and its subsidiaries, and Epitaph have all been around that long, too– but Thrill Jockey is a bit different from those in that it seems more like a tight-knit group of artists. I think maybe the way Blue Note or Stax was in their heyday. 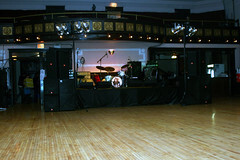 As mentioned earlier, I attended the two-day Thrill Jockey 15th Anniversary Party Shows at Logan Square Auditorium in Chicago. My friend Erik attended the shows with me. Erik’s a pretty big Thrill Jockey fan himself and in particular he was looking forward to the Califone and Sea and Cake shows. I was very happy he came along– it’s always better to see shows with someone else in my opinion. Plus, we split the gas and lodging, so that was helpful. We took the day off work to drive to Chicago. The plan was to get checked in, get our bearings, get something to eat and get to the venue early enough to give us time to get parked. We were fortunate that there was good parking right by the venue– especially because we showed up before 6PM. As it turned out there was a neat little lunchcounter establishment called Johnny’s Grill where we ordered hamburgers and fries at the corner on the same block as Logan Square. We ate there both nights because the food was inexpensive, good and simplified our plans. On the first night Erik and I were the first people in the door. Security was run by the security for the Empty Bottle who was putting this on with Thrill Jockey and Listen Up Chicago. They also handled the dispensing of the liquor. Pabst was the beer sponsor, so there was Pabst specials, and it appeared that was what most of the bands who were drinking were drinking. They also had Goose Island in bottles, which was what Erik and I were drinking. I think we had the India Pale Ale. Logan Square Auditorium also known as the Gilbert Building appears to be an old-time ballroom with wood floors and big plaster medallions on the ceiling. To maximize the number of bands that could be fit in, there were two stages opposite of each other. While one band was performing the next act would be setting up. Generally, there was about five or ten minutes between acts and each act got about 45 minutes. No acts got an encore– except for Fred Anderson– and he deserved it. 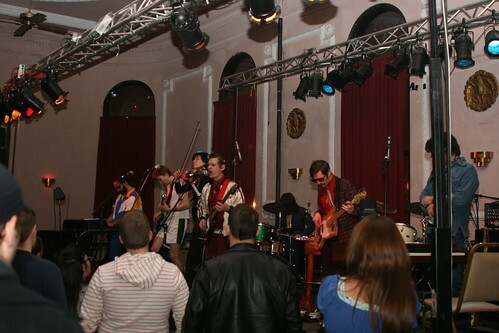 Above the first stage by the entrace was a balcony which was reserved for the bands and their guests. 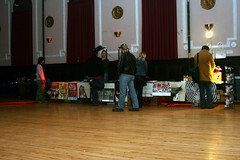 Between the two stages was the Thrill Jockey merch counter– a place of bustling activity as you might expect. Thrill Jockey promised to have some rare items for sale that night– I was hoping for OOP Tortoise vinyl but no such luck. They did have some 7 inches that were pretty rare and in the case of Arbouretum there was some vinyl from their personal stash. They did bring some of the cool apparel items, so that was a good night to pick up the Tortoise hoodie or the TJ beanie if you were looking for that. They also had the new Plum 7-inch boxset for sale and they were giving away the Trey Told ‘Em mix CD to pretty much everyone who came in the door. Before the show at Johnny’s Grill a nice patron let me borrow the latest issue of the Chicago Edition of the Onion which had an interview with Bettina Richards as well as a picture of her so I was able to identify her in the crowd. I talked to her a couple times over the two nights and she was a really friendly and courteous person and seemed really happy that the event kicked off without any noticeable (at least by me) hitches. She was clearly the host of the party and it seemed like she was mingling with the crowd and the bands equally. Most of the bands throughout the nights wished her a happy anniversary or thanked her. It occurred to me that she’s probably known some of these people for longer than the 15 years of Thrill Jockey– the members of Tortoise and Eleventh Dream Day for sure– and it was clear that she was friends with them. 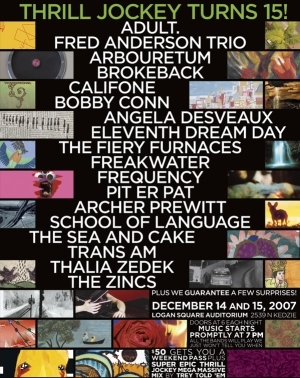 The band lineup pulled equally from the early days of Thrill Jockey– The Sea and Cake, Eleventh Dream Day, Trans Am, Tortoise as well as new acts like School of Language and Arbouretum– and they all got equal billing which shows that the label owes as much to the present bands as to the bands that have been on the label for a while. One thing Erik and I learned the hard way was that it was imperative that we sat down from time-to-time! Unfortunately, there really wasn’t any place to sit but the floor or lean on the opposing stage for those bands for which we didn’t desire to be close. The first bands started around 7PM and we got to the venue around 6PM. Since the show generally went until 2AM– that meant we were on our feet for the most of EIGHT HOURS! Especially given that there wasn’t much time between sets. Needless to say after the first night’s show were were in a lot of pain. Another observation I’ve made is about the photographers who were covering the show. I was there with a camera to take pictures for this article as well, but I try to be respectful of the bands as well as the other people who attended the show. I like to hang back a bit, make sure I’m not in the way, and only step in for an occasional picture. Some of these guys were chimping dozens of shots per band and were right up against the stage. One of the photographers for one of the huge not-music-blogs had one of those Sto-Fen Omni Bounce Diffusers on his flash which are used to soften the shadows which sometimes occur from using a flash. For whatever reason this guy was using his with the flash head pointing at the ceiling effectively blinding everyone in 360-degrees around him. Dude, if you’re reading this, it’s something you should know if you didn’t. You could have pointed the flash head at your subject since you were diffusing the flash. Aside from that, the show was incredible and very much worth the trip and the very reasonable ticket price. I really felt like this show was an opportunity of a lifetime! Out of all of these bands, I’d only seen Tortoise and Pit-Er-Pat previously so it was amazing to see the rest of these acts if only for 45 minutes apiece! I think everyone put on a really good show and seemed to be enjoying being part of this tribute to the label on its home turf. 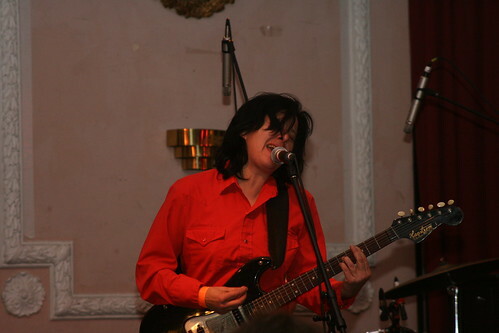 Across the floor after Brokeback was Thalia Zedek who put on an amazing set. I’m not sure why I hadn’t gotten into her music before– she put on a very impassioned and energetic set. Sort of like a folky version of Patti Smith. I plan to start looking into her back catalog. From the edgy music of Thalia we are turned to the polished guitar pop balladry of Archer Prewitt. Archer was one of the sets I was really looking forward to. I’ve been following Archer since his White Sky album came out. Although he is a member of The Sea and Cake I hadn’t heard his first album I guess because it wasn’t on Thrill Jockey. He is now, of course and his last two albums Three and Wilderness are brilliant. His set focused on those two releases and I was impressed at how his sound works in a live setting. For the whole set he was playing this really nice-looking Jerry Jones Danelectro copy. One band I was curious about was Arbouretum. I hadn’t heard any of their music before the show was announced, but I visited the streaming tracks from the Thrill Jockey site and really liked what I heard. I’m not sure how to describe it– it’s a bit like folky sea-shanty type songs infected with 90’s grunge influence. Dave Heumann propels the songs with his trusty vintage Danelectro through washes of distortion. Some of the songs are short and to the point while others take a slightly psychedelic jam and solo. Out of the newer music I heard this weekend, this band is one I keep coming back to. Heumann’s side project with Lungfish member Nathan Bell will be releasing their first full length at the end of this month and it is very complimentary to the Arbouretum songs. As a side note, the second night I wanted to pick up Arbouretum’s new album Rites of Uncovering on vinyl as I’d seen it there on Friday. I was informed that the copies they had for sale actually came from the band as the label had sold out of them! I was pretty bummed, but I reached out to Dave Heumann through the Arbouretum MySpace page and although he wanted to save those copies for their live show merchandise he was feeling the holiday spirit and sold me one. I should be getting my copy this coming week. Thanks Dave! 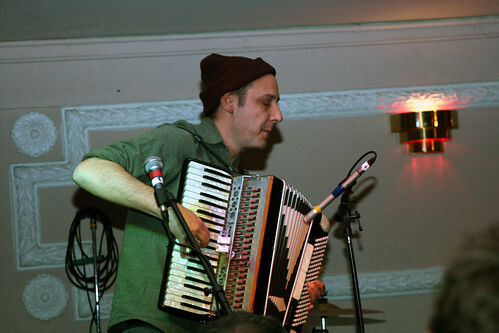 Before The Sea and Cake hit the opposing stage we got one of the “surprise” acts– the Lonesome Organist hit the stage with his accordion and played a quick tune. It seemed really spontaneous and a crowd quickly gathered. As he was leaving the stage the crowd shouted for another song, so as he was making his way through the throng he obliged. The Sea and Cake came on and did a great set with mostly songs from the new Everybody album. A couple of the songs were a lot more uptempo than the album to which Archer commented that someone gave John McEntire a cappuccino. I was really impressed with the bass playing of Eric Claridge! He plays some really complex bass lines. I was bummed that I didn’t get to see them last Fall when they hit Minneapolis and Madison. Up next was David Brewis as School of Language. He flew in especially for the event which was his U.S. debut and had only a day to prepare the guys who were stepping in as his band. His band for the night was Nick Macri of the Zincs and Ryan Rabsys of Euphone. They did a great job sitting in for him. This show was much better than I expected. I really didn’t have a chance to hear any of his music since the album wasn’t out. David’s new album Sea from Shore— currently streaming at the Thrill Jockey site– is a quirky guitar pop album which dashes of Prince falsetto and angular beats. 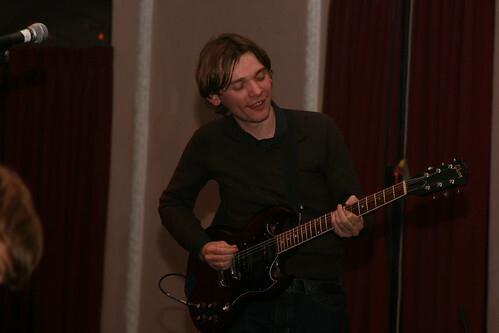 David had the distinction of playing one of the few Gibson guitars at the show. Next up on the same stage was the Fred Anderson Trio. Fred is kind of a local Jazz legend. He is the owner and frequent entertainment at the Velvet Lounge in Chicago and has a very extensive career. 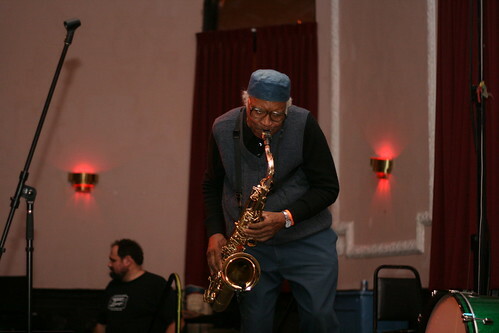 For a 78-year-old he sure can wail on the sax! I think that his band was Chad Taylor and bassist Josh Abrams– both Thrill Jockey regulars. When his set was done, the audience was so moved that they cheered for an encore! This was to be the only encore of the entire two-day affair! 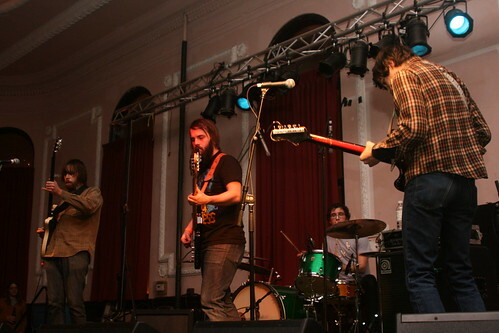 The Fiery Furnaces used their 45 minutes to play most of their new album Widow City. This is an album I’ve listened to on-and-off since I got it. 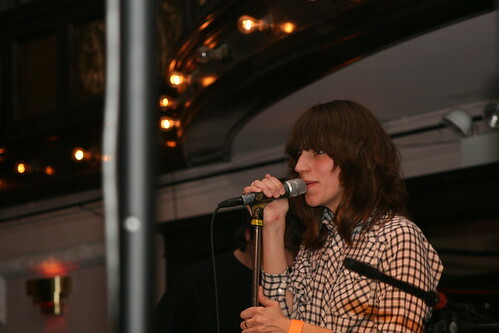 I like Eleanor Friedberger’s voice– it has a kind of urgency that reminds me of Crissy Hynde of the Pretenders. Overall I think it’s a good album, but it sometimes seems like every song is the same formula– a sort of cut-and-paste feel to it with jarring changes. Impressively, they do a great job performing this live. However, a full set of this seemed numbing to me after a while. A friend of Erik’s saw the Furnaces in Minneapolis last year and his observation was that people either really got in to them or they didn’t. This night I didn’t. Something else I found off-putting was that Eleanor kept walking off stage and seemed irritated about something maybe with the sound. The crowd really got into them it seemed, but by this time of the night the crowd started thinning out. Erik and I stuck it out until the end of Bobby Conn’s set anticipating that maybe there would be some sort of announcement or comments from the organizers. 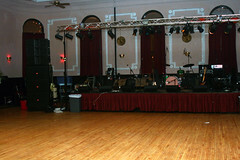 By the end of the set the venue was pretty much vacated– I think there might have been around ten people left. The band finished, the houselights came up and Erik and I headed back to the hotel. See all the pictures I took on Day 1 of the Thrill Jockey 15th Anniversary Show. The Time to play b-sides archives for the bettina-richards tag.